The size of the Physioball depends on your height. – 5’ 4” or shorter- purchase a 55 cm diameter ball. – Taller than 5’10”- purchase a 75cm ball. * When you sit on the ball, your knees should be at a 90 degree angle. 1. 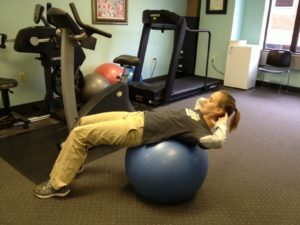 Crunches- Sit on the ball and walk your feet out so the ball is under your mid back. Clasp your hands behind your head and do a partial sit up. You can also come up rotating to each side to work the obliques. floor. Walk your hands out so the ball is under your thighs to perform a push up. The farther the ball is toward your ankles, the harder it will be to do the push up. 3. Squat- Put the ball behind your back against the wall. Tighten your abdominal muscles and perform a squat holding it for 5 seconds. 4. Russian twist- Sit on the ball and walk your feet out in front of you until the ball is under your shoulder blades. Clasp hands toward the ceiling or hold on to a weight. Rotate your upper torso to the left then the right. 5. Bridge- Lie on the floor and put your feet up on the ball with your knee straight. Raise your bottom up into a bridge and hold for 5 seconds.